A gaming PC is not all about graphics card, fast processor and huge amount of memory. Yes these components are most important for a PC gaming but your gaming experience will not be any fun if you don’t have a good gaming mouse and a gaming keyboard. Even if you have a good gaming PC configuration but have a basic mouse and keyboard then you gaming experience will definitely be ruined. Gaming mouse and keyboard can be very expensive but budget options are also available and they do provide an enjoyable gaming experience. Earlier in this blog only I have written a post on best budget gaming mouse in India but here I am going to provide the list of best budget gaming keyboards that you can buy in India. These gaming keyboards are priced from Rs. 1000 to Rs. 3000 and come with almost all the features that are present in the more expensive gaming keyboards. Here are the best affordable gaming keyboards that you can buy in India. These gaming keyboards will help you to dominate in games and reduce finger strain. All the below mentioned keyboards are membrane keyboards because mechanical gaming keyboards are very expensive and can really go out of your budget. 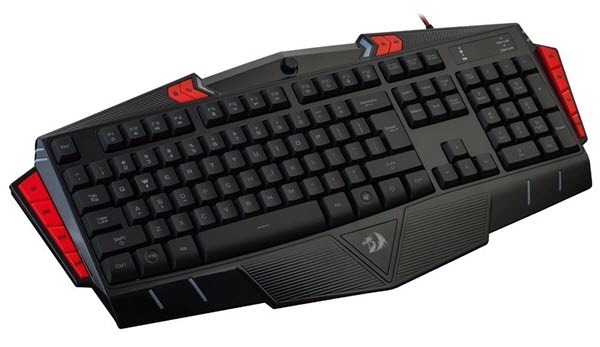 Redragon Karura K502 is a sleek gaming keyboard that comes with almost all the features that you can find in a high-end mechanical gaming keyboard. This budget gaming keyboard comes with chiclet keys which are low profile in nature. You normally find chiclets keys in laptops and they are very shallow which means you do not have to press these keys deep. The construction quality of the keyboard is very good for a budget gaming keybooard. There are 104 standard keys and 12 multimedia keys. All the keys and the Redragon logo on the armrest have 7 switchable backlight colors and 4 LED brightness levels. The armrest on this gaming keyboard is fixed permanently which means you cannot remove it. The keyboard comes with adjustable pulsing rate LED lights, interchangeable WASD & arrow keys. There are 19 conflict free keys which is one of most important necessity of gaming keyboard. You can get this gaming keyboard at around 2000 rupees. Circle is an Indian brand that is popular for its budget gaming cabinets and other computer accessories and peripherals. Here we have Circle Adroit X7C Gaming Keyboard which is a decent affordable gaming keyboard for budget conscious users. It is a normal sized keyboard that comes with standard sized keys. The keys are well spaced which makes them easier to use during gaming. This gaming keyboard comes with 7 color (Blue, Red, Green, Purple, Light Green, Turquoise and White) LED backlighting, 19 Anti-Ghosting keys, 6 multimedia keys, interchangeable WASD keys, Intelligent independent lock, Windows independent lock and breathing light effects. It is a spill proof keyboard and it has solid construction quality for a budget gaming keyboard. Redragon ASURA K501 is one of the best budget gaming keyboards in the market right now. It is big, has modern design and it really looks like a high-end premium gaming keyboard. The keyboard comes with regularly sized 104 standard keys and 12 multimedia keys. It has 8 programmable macro keys that do not require any software for installation. There are also 2 options for input speed. This spill resistant gaming keyboard has got 32 conflict free keys or n-key rollover. 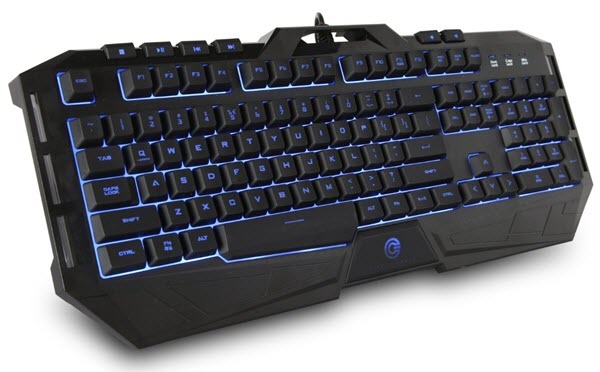 The various features of this gaming keyboard include 7 color backlit keys, adjustable backlight brightness, adjustable pulsing rate for LED lighting, Interchangeable arrow / WASD keys and Windows Keys disable key. You can get this premium budget gaming keyboard at a great discount from the link given below. If you want a popular branded gaming keyboard then Logitech G105 Gaming Keyboard is what you should consider. This may not look fancy as others in this list but it is decent gaming keyboard that has big brand name associated with it. The keys on this keyboard are backlit by only one color which is blue. Logitech G105 comes with 6 programmable G-Keys and you can assign total of 18 functions to them. There are total of 5 non-conflict keys in this gaming keyboard. These are just like the macro keys that you find in other gaming keyboards. The game mode switch allows you to disable windows key during gaming. This is a good keyboard but may not be as feature rich as the other rivals in this list. This is one of the best branded gaming keyboards that you can buy at an affordable price range. 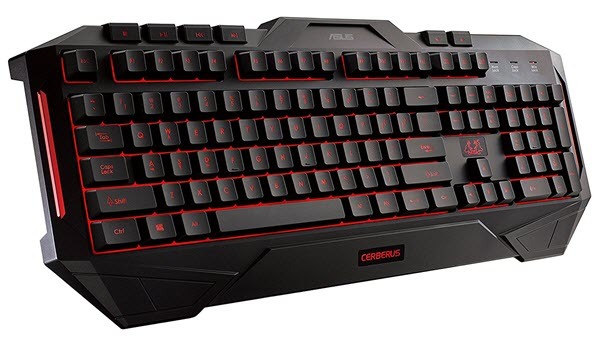 ASUS Cerberus Gaming Keyboard is a rock solid gaming keyboard that is durable and comes with all the essential features of a gaming keyboard. This gaming keyboard comes with Full SECC metal plate for added durability and rigidness for intense gaming sessions. It has got splash-proof design and comes with dual color LED backlighting. There are 12 macro keys and rubberized feet to prevent it from slipping on your desk. You can get this high quality gaming keyboard at around 3000 rupees from the link given below. At the end I would like to say that if you are looking for a good budget gaming keyboard then you cannot get anything better than the ones mentioned above. These budget gaming keyboards will definitely put smile on your face and increases your performance in gaming. If you have any queries then feel free to ask me by leaving a comment below. Hi which is the best gamepad under rs 500 available in India? Just Ok or same as redgear. I want to buy best budget keyboard under 600 rupees ? In terms of durability and working experience… I dont play games that much but sometimes i do play pes. Which keyboards would you recommend? I want to buy from Flipkart as I have gift card balance, would you please recommend any keyboard from there ? Your suggestion is awesome . how much is your budget for keyboard? I suggest you to go for Amazonbasics keyboard. Hi akshat, i wanted to buy a mechanical keyboard for gaming,my budget is 3.5k.m currently using a membrane keyboard and not tried any mechanical before.plz suggest me a good keyboard.i found a brand on amazon….brand name was cosmicbyte.i dont know wheather its good or not but they selling mechanical keyboards at a cheap price like 2.4-5k……. I strongly suggest you to stay away from these unbranded Chinese mechanical keyboards as they are not worth it. In this budget you can go for the good old TVS Gold Mechanical Keyboard with Cherry MX Blue switches.